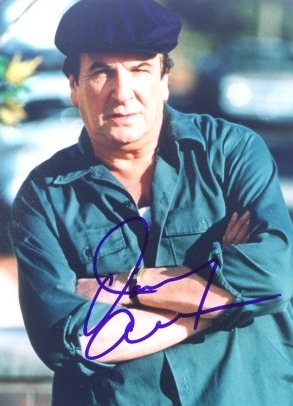 Father of Danny Aiello III, Rick Aiello, 'Jamie Aiello' and 'Stacy Aiello'. One of the screen's most compulsively watchable players, Aiello has virtually cornered the market on tough, urban ethnic types, playing cops, hoods, and working-class Italian patriarchs. This accomplished stage veteran was in his late 30s when he made his screen debut in Bang the Drum Slowly (1973), but he has worked steadily in films since. Although his characters are often crass, vulgar, and violent, Aiello has also portrayed sensitive, kindly men- with an earthy sense of humor. His films include The Godfather, Part II (1974), The Front (1976), Bloodbrothers (1978), Fort Apache, The Bronx (1981), Once Upon a Time in America (1984), The Purple Rose of Cairo, The Stuff (both 1985), Radio Days and The Pick-Up Artist (both 1987). Aiello's career shifted into high gear following his well-received turn as Cher's mama's-boy suitor in Moonstruck (1987). He was Oscar-nominated for his portrayal of Sal, the pizzeria proprietor in Spike Lee's Do the Right Thing (1989, for which Lee allowed him to write much of his dialogue). Eddie Murphy used him in Harlem Nights (1989), and he appeared in Jacob's Ladder and The Closer (both 1990) before startling moviegoers with his singing voice in Once Around (1991, playing Holly Hunter's father) and Hudson Hawk (1991, as Bruce Willis' sidekick). By 1992 Aiello had seemingly demonstrated his ability to carry a movie, but his starring vehicle Ruby (1992) flopped at the box office and disappeared almost instantly. Since then he has appeared in Mistress (1992), The Pickle (1993, in the leading role, as a desperate moviemaker), The Cemetery Club (1993, as Ellen Burstyn's love interest), Me and the Kid (1993), Ready to Wear/Pr�t-�-Porter, and The Professional (both 1994).